Join us for a special event for the children’s book Badda’s Buddy written and illustrated by local artist Lois Tønnessen Andersen. 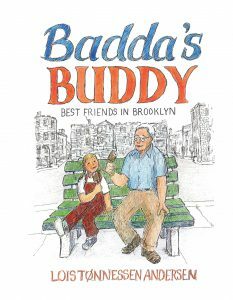 Badda’s Buddy is the story of Lisa and her grandfather, who are best friends. They go through their days together, shopping, working, and having treats. Every day is a good day when Lisa and Badda are together! One day, another girl comes in to the picture, and Lisa became very worried that the good times are over for her and Badda. Set in mid-century Bay Ridge Brooklyn, Badda’s Buddy shows us that the “melting pot” that Brooklyn is, has always been a home for immigrants from around the world, one generation at a time. Join us for a special reading of the story by Lois while enjoying cookies and a special craft.